When people go digging deep underground, it’s usually for one of two things (although sometimes both): wealth or curiosity (see: archaeology). 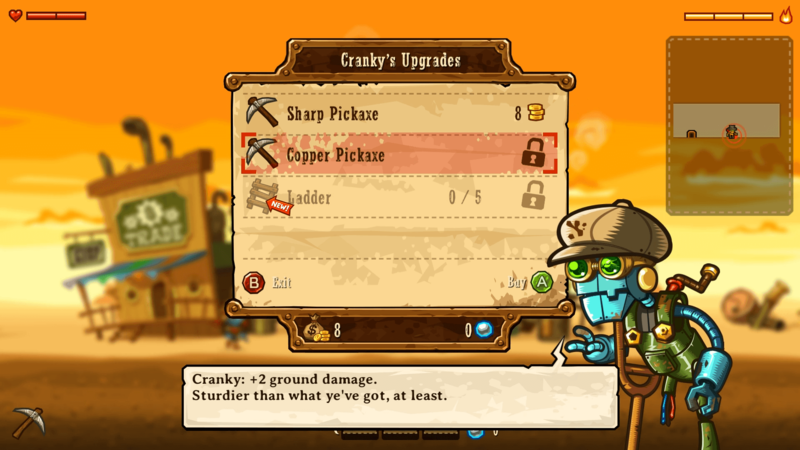 In the case of Rusty, SteamWorld Dig‘s protagonist, it’s… a bit of both. Having received the claim to his uncle’s mine, he takes after him and gets to digging, albeit rather reluctantly. On top of that, as fate would have it, all is not quite right in the depths below town, and digging for valuables soon becomes rather… hazardous. I mean, early on, everything’s just peachy in this metroidvania miner. Minerals, precious stones, gems and other valuables are plentiful, right there for the taking, not a care in the world. Pickaxe in hand, I was able to guide Rusty deeper and deeper, always making sure I had a safe path back topside as I went along. See, while the funky little steambot protagonist is capable of wall-jumping, the distance he’s able to cover is a tad limited. Until later on, that is, at which point everything began changing. Two meters became five, then eight, ten, fifteen, and suddenly I found myself bashing through dirt and rock alike, well beyond twenty meters below the surface, suddenly forced to deal with critters. Nothing my trusty pickaxe couldn’t handle though, and a few smacks to the face took care of those pests. No sweat. But like the abilities of Rusty, combat too would see an increase in complexity as the game progressed. For now though, it was mostly a matter of excavating for stuff to sell until my pockets were full, head topside to exchange their contents with Dorothy for lovely dollar bills, inching ever so closer to the next tier of available upgrades. This was one thing that didn’t really change over the course of the five or so hours it took to finish the game, as I was constantly delving deeper, acquiring increasingly valuable minerals/gems/ores, heading topside every so often for an exchange. If I’m perfectly honest, it’s also the one aspect that got just a bit repetitive, and rather quickly at that. Not that I can imagine a way to vary it, mind you, but that doesn’t make it any less of an annoyance. Fortunately my hard work would pay off, as over time, more and more upgrades became available to Rusty. Upgrades which would all provide some much-needed improvements to his mining gig. A larger pouch meant I could carry more each trip while lantern upgrades ensured I could see where I was going for longer periods, and of course, higher quality pickaxes… to mine faster and dig through stuff stronger than basic dirt/rock. Plenty to spend your hard-earned money on, that’s for sure. And those are just some of the things available for purchase. 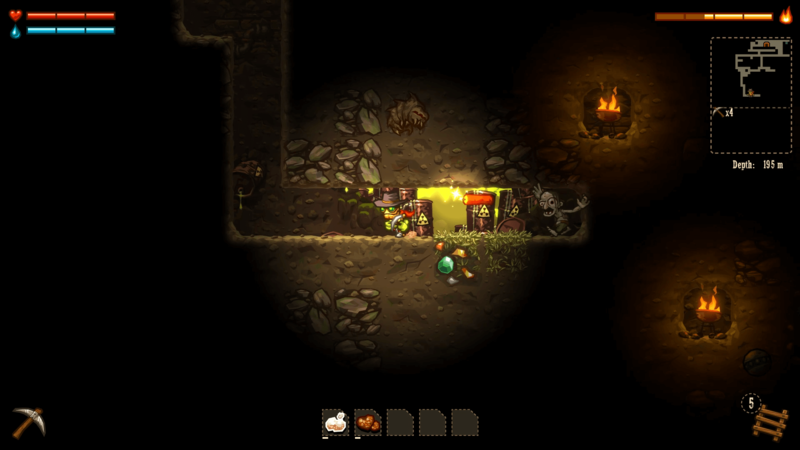 Consumable items like ladders and placable light sources are also a thing, as well as improvements related to abilities Rusty would acquire late in the game. Ones I shall not spoil here, but to say that they have to do with steam. Yeah. But first things first, as much digging, running, jumping and smacking of critters – and other nasties – in the depths is required to even reach the point where Rusty gets any of said abilities. I found the digging aspect to be quite alright, and the same goes for running and even combat. Jumping, on the other hand, felt slightly off. Especially when trying to perform acrobatics while sliding down a wall – which I suspect is how most people will be climbing back out during the first many meters (later you’ll be able to acquire faster means of transportation). Although while undeniably frustrating to plummet time and time again due to a missed jump, it didn’t ruin the experience for me. Not in the slightest. Neither did the repetitive process of digging, returning to town, digging some more, rinse and repeat. I was simply too engrossed to let it get to me, eager to find out what I would uncover next. What else Rusty’s uncle (may he rest in peace) had left for me, and why, as I delved ever deeper into the mine. As it turns out, a lot. A lot of interesting bits and pieces, of various technological designs, were discovered by digging in just the right spots (okay so maybe the map did point out where I had to go next, upon reaching certain depths). This is where the gameplay began improving significantly. No longer would Rusty be limited to jogging along or only jump as high as his own two feet allowed him, for now, powered by crazy inventions, he was able to dash and perform oddly steam-propelled leaps upwards. Odd stuff? You have no idea, and this was just the beginning. Most of these inventions had a bit of a limitation applied to them though, in that… well, they ran on steam, so if your water tanks were empty, no go. No steam-propelled jumps or… wait, no, I’m not going to spoil what other fun things Rusty was able to acquire during his journey. What a journey, though! One that took me several hundred meters below the town in search of, well, answers. Why would Joe – Rusty’s uncle – leave all those things behind, why had the critters suddenly become hostile, and… well, suppose curiosity also played its part. As it has a tendency to do when a mystery like this crops up. Good thing it did, because by the time Rusty had acquired a fourth ability, the metroidvania bug had sunk its teeth into me but good, and I wanted to explore deeper, see more, find out what lies beneath. Beneath it all. Oh, and the townspeople would frequently make brief comments on the strange things Joe would bring back from his time in the mine. So there’s that too, and if that’s not enough to stir up a good amount of curiosity, I don’t know what is. One upgrade/ability acquisition after another, resolve and survivability alike strengthened, deeper and deeper me and Rusty went, frequently stumbling upon new discoveries. Including what the townsfolk would refer to as ‘shiners’; sleeping zombies at best, dynamite-wielding crazies at worst. Troublesome bunch to say the least, but the show must go on, so in spite of several of them getting the better of us, we pushed through and eventually… uh… I’m not really sure how to describe what we encountered. I will say this though: it was quite a sight, and definitely not what one would expect to find below the surface. I mean, sure, at this point we were way down there, possibly deeper than but a handful of people had ever gone. But again, I shall not spoil this final bit of the journey, much as I’d like to write several paragraphs about… it. Instead I’m going to wrap up this slightly unorthodox review with a wholehearted ‘buy this game!’ comment. Or maybe wait for a sale? 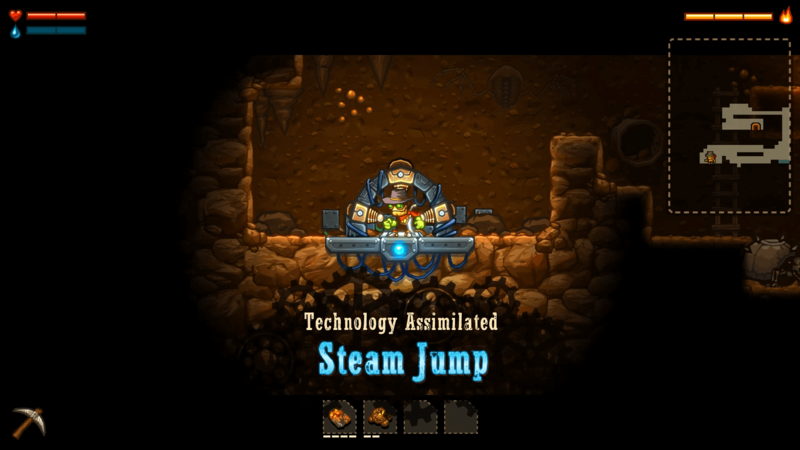 Either way, you should definitely keep SteamWorld Dig in mind, the next time your wallet fancies some steampunk-y metroidvania with an excavation attachment. Because while it’s not without flaws, my time spent with Rusty did make me more than a little eager to pick up and play the recently released sequel, SteamWorld Dig 2. Mine? 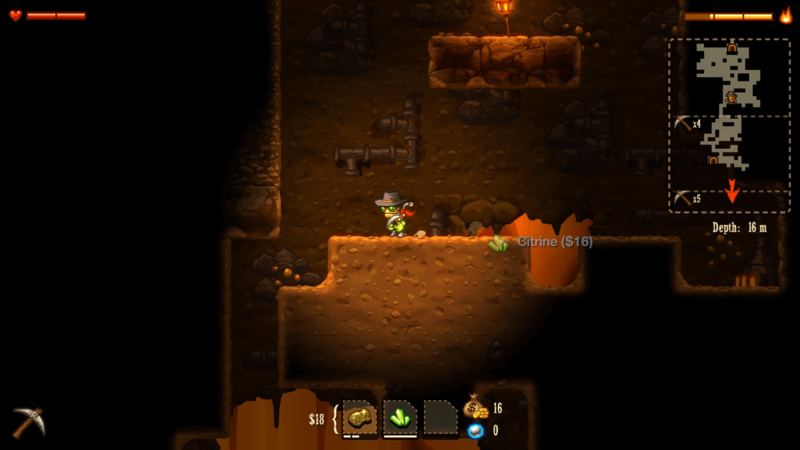 SteamWorld Dig is available on Steam (reviewed), PS4/Vita, 3DS, Wii U, Switch, Xbox One, at either $8.99 or $9.99, depending on the platform.